Print off this 31 day prayer calendar for the month of July to help your children learn to pray BIG! 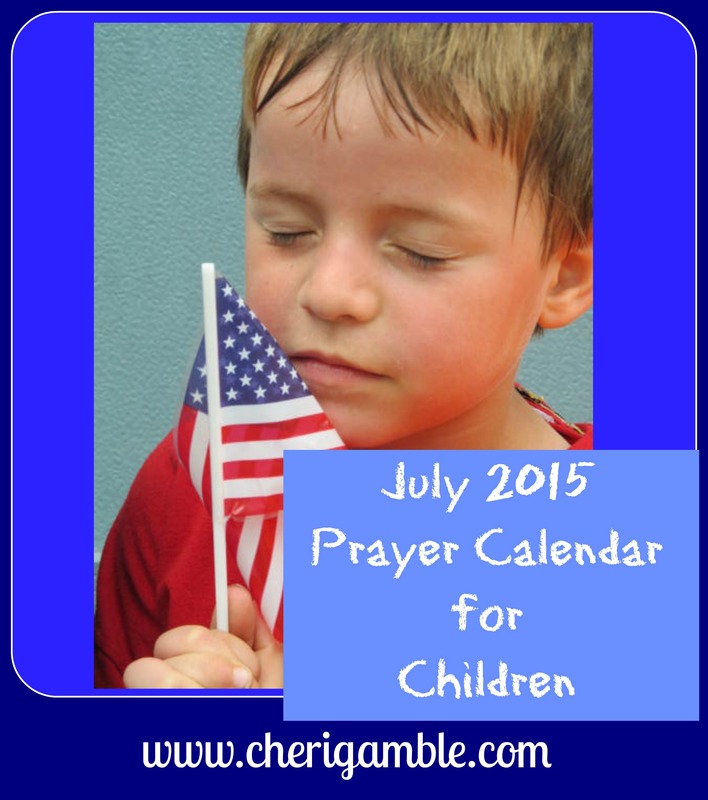 It has been a full year since I started posting prayer calendars for children on Ministry Mom! I hope and pray that you have been able to use these calendars with your children and that the calendars have helped your children to develop a more meaningful prayer life. It is so exciting to think of the impact that the prayers of our children can have — an impact that we might never totally understand until heaven. Please print off this month’s calendar and then share this link with your friends. Let’s get all our kids praying this month! And, if you haven’t joined our facebook group yet or liked my facebook page, please do so today. Let’s encourage one another as we strive to raise godly kids in today’s society! 1 Pray for your parents to love and serve Jesus with their whole hearts! 2 Pray for your family to demonstrate forgiveness when needed. 3 Pray for the strength to resist your greatest temptations. 4 Watch fireworks and praise God for His POWER! 5 Jehovah Nissi – Praise God that He is victorious! 6 Pray for any location suffering from a recent natural disaster. 7 Pray for the Supreme Court of the United States to seek God in all their decisions. 8 Choose one of your friends and pray for him and his family. 9 Pray for God to help you to forgive when you really don’t want to. 10 Pray for the music industry. 11 Do some yard work for a neighbor or elderly friend. Share God’s love with him! 12 Jehovah Jireh – God our provider. Praise God for always providing for you. 13 Pray for the orphanages around the world. 14 Pray for your local and national police force. 15 Pray for your siblings. If you are an only child, pray for yourself. 16 Spend time today thanking God for how He has forgiven you. 17 Pray for the people who make video games. 18 Make a “free” lemonade stand for your neighbors! 19 Jehovah Rapha – The God who heals. Pray for the healing of the nations. 20 Pray for the persecuted church worldwide. 21 Pray for God to raise up Christian politicians and leaders. 22 Pray for your favorite celebrity to find Jesus. 23 Pray for a forgiving spirit to spread across your nation. 24 Pray for the people who write movies and television shows. 25 Make your own rock “praise” garden by decorating rocks to bring praise to Jesus! 26 Praise God that He is Sovereign and ultimately in control of all things! 27 Pray for Christians who are currently in prison for their faith. 28 Pray for farmers today! 30 Pray for your local church to demonstrate forgiveness in your community. 31 Pray for the temptation to grumble and complain.